Shipping channels in harbors around the world have been extensively deepened and widened to accommodate the rampant proliferation of mammoth container ships. What are the impacts of these changes on tidal flows hidden beneath the surface? You often see them, faded and covered in graffiti, as you pass them on the highway, or piled 40 feet high in industrial waterfronts of working cities: the ubiquitous steel shipping containers that efficiently transport everything from coffee to cars around the globe in a matter of days. The containers are commonplace today, but their widespread adoption was initiated only 62 years ago. On April 26, 1956, the SS Ideal X, a reconfigured naval refueling ship, left Port Newark, New Jersey, carrying a cargo of 58 containers. When the ship arrived five days later in Houston, Texas, the containers were offloaded onto waiting trucks, completing the first commercially successful container voyage and starting the dawn of the modern shipping era. The introduction of a single container that could be transported on trucks, trains, and ships revolutionized these modes of transportation. 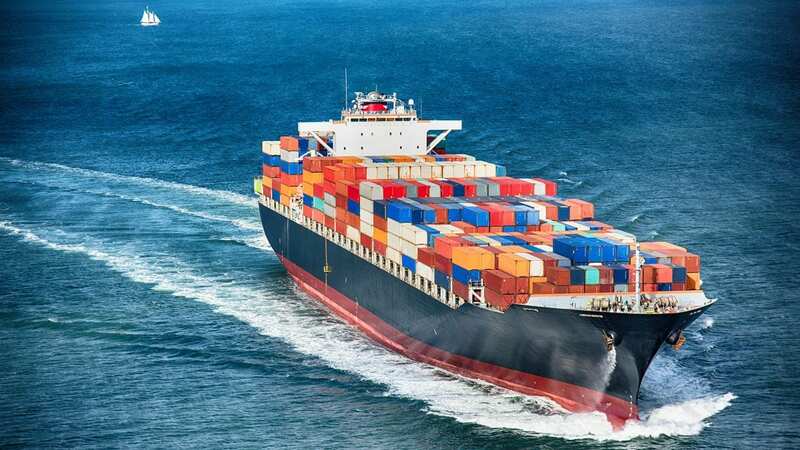 For ships especially, the container streamlined the shipping of bags of coffee or boxes of tea that had been individually loaded and unloaded for centuries. Now, small goods could be packed into the larger, standardized containers and shipped anywhere in the world on an entire transportation network designed exclusively to carry containers. To carry the maximum possible number of containers, ships expanded to gargantuan sizes that were limited only by the dimensions of the largest international canals. As ports clamored for business from ever-larger container ships, they embarked on a stream of dredging projects that continues to this day. In Newark Bay, New Jersey, dredging projects have both deepened and widened the shipping channel, in some places blasting through solid rock, to create the channel that exists today. At 50 feet deep, the channel matches the dimensions of the newly finished expansion to the Panama Canal, ensuring that New York remains a hive of shipping activity for years to come. But this economic progress has come at an environmental cost. 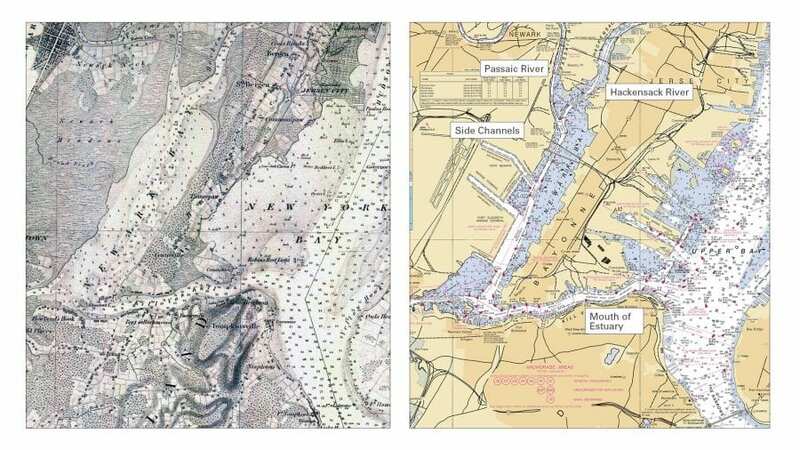 Miles of pristine marshlands that surrounded Newark Bay in the 1860s have been steadily filled in to make room for Newark Airport, dockyards, and the immense shipping terminals that loom over the western side of the bay. The shape of the bay itself has been dramatically altered, too. Over the past 150 years, the central channel has been deepened by nearly 300 percent—more than any other port on the U.S. East Coast. In addition, two large side channels, each 1.4 miles long, have been carved out of the former salt marsh to triple the number of ships that can unload at one time. The effects of these changes are highly visible—from the vast extents of green that have turned into gray concrete and steel to the stands of dead cedar stumps strewn through the marshes at the head of the bay. But what about the invisible impacts? Behind a watery curtain, an unseen dance goes on between fresh water and salt water within the bay. Twice a day, the tides orchestrate the performance. As the tide rises, it pushes salt water from the ocean into the bay, where it meets fresh water flowing down from the Passaic and Hackensack Rivers. And as the tide falls, it pulls both fresh and salt water out to sea. No one knows how the mammoth alterations to Newark Bay have affected the natural dance of fresh water and salt water, nor how any changes in these flow patterns may have affected the local ecosystem. I’ve been trying to peer behind the curtain to answer those questions—in part by deploying oceanographic instruments into the bay. Newark Bay is an estuary—a region along the coast, typically at the mouth of a river, where fresh river water and salt water from the ocean meet and mix. We often notice tides as the slow rise and fall of the ocean at the beach. Within short estuaries such as Newark Bay, water slowly rises during flood tide as it flows into the bay from the ocean. The water level pauses when the bay temporarily stops filling with water, and then drops as water leaves the bay during ebb tide. This cycle occurs roughly twice each day along the U.S. East Coast, each time reversing the direction of water within coastal harbors and bays. The salt in seawater makes it heavier than fresh water, so the fresh water flowing out of the bay glides over the top of seawater like a layer of oil atop vinegar in your salad dressing. The heavier seawater similarly slides in from the ocean along the bottom of the estuary, beneath the freshwater layer. If you were to give your bottle of salad dressing a good shake and let it rest, the boundary between the oil and vinegar would become blurred. You’d get vinegar at the bottom, blending into mostly vinegar above it, to mostly oil a little farther up, and finally to pure oil at the surface. In estuaries, the salt water is similarly blended into fresh water, creating layers of water, each with a different salinity. No one gives the estuary a good shake; the blending is instead caused by waves breaking at the surface of the water; water moving rapidly over bumps on the bottom of the estuary; or even fresh water moving rapidly over saltier water. All of the mixing and pushing and pulling of the tides smooths out the transition from seawater at the mouth of the estuary to fresh water at the head of the estuary. If no other factors intervened, salt water would smoothly transition into fresh water as it traveled up the length of the estuary. But other factors do intervene, so the salt/fresh water transition does not always run smoothly over the course of the estuary. Sometimes conditions even place parcels of distinctly salty and fresh water right next to each other. This boundary between this rapid jump from salt water to fresh water is called a salinity front. It’s the underwater equivalent of atmospheric cold- and warm-air fronts that you see on weather reports. The different-density fluids on either side of the fronts don’t mix; instead, one moves rapidly in response to the movement of the other. Warm air rises and cold air moves in to replace it. Similarly, in Newark Bay, lighter fresh water rises and denser salt water moves in to replace it. So how has the industrial development of Newark Bay affected these dynamical processes? The most visible evidence of changes to the local ecosystem are those cedar stumps 6 miles inland from the head of the bay. Atlantic white cedars grow only in freshwater marshes. So along the U.S. East Coast, stands of dead cedars act as signposts for marshes where salt water has intruded farther inland, killing off the freshwater species and drastically shifting the ecosystem. In Newark Bay, this inland intrusion of salt water was likely brought on by a combination of human activities. Fresh water discharged from upstream rivers can generally hold back saltwater intrusions. But in the 1920s, a dam across an upstream river drastically reduced the fresh water supplied to the estuary. At the same time, the shipping channel was dredged 10 feet deeper than before, allowing room for more salt water to slide underneath the fresh water pouring out of the river. Combined, these effects likely allowed salt water to intrude far upstream, changing the former freshwater marshes to salt marshes. But how else has dredging changed the flow patterns within Newark Bay? To answer that question, we lowered four 3-foot-wide metal frames to the bottom of the bay in the early spring of 2016. Each frame carried instruments that measured the speed, depth, and salinity of the water at each location every ten minutes for at least three months. We put each of the frames into a different part of the bay, so that when we were finished, they made a string of sensors that stretched from the mouth of the bay in New York Harbor to the source of fresh water in the Passaic River. Once a month, we also returned to Newark Bay in a 30-foot boat, darting around 1,000-foot-long container ships to collect measurements of the salinity and speed of the water within the bay, compiling a series of snapshots of the internal structure of the estuary. These snapshots, combined with the data collected from the bottom frames, revealed that salinity fronts occur throughout Newark Bay. They form because of the unique natural shape of the bay, and because of the industrial development that has radically altered the bay’s configuration. One front consistently forms at the mouth of the estuary, where the bay opens up into the harbor. The width of the estuary suddenly expands, and the ebbing freshwater layer at the surface spreads out into a thin, widening plume atop the sea surface. This expanding freshwater layer lifts up and over the saltier water below. As the ebb tide rapidly flushes fresh water out of the estuary, this saltier water often remains nearly stationary. And as the salinity difference between the ebbing fresh water and the stationary salt water increases, a salinity front forms. At the mouth of Newark Bay, the difference in salinity across the front is so great that the salt water starts creeping upstream underneath the still-ebbing freshwater layer. As the tide pauses, and then begins to flood, the front continues to advance up the estuary, eventually reaching far into the bay. At that point, another more recently created phenomenon bolsters the advance of salt fronts farther up the bay. Remember those two large channels sliced into the side of Newark Bay? During flood tides, seawater flowing behind the advancing salt front fills in the side channels, creating temporary reservoirs of salt water. As the tide changes back to ebb, the salt front begins to weaken and is pushed downstream by outgoing fresh water. But then something unusual happens. The salt water that was pushed into the side channels during the previous flood starts to push back out into the estuary. It’s saltier than the water in the estuary, so it slides back into the estuary along the bottom. The slug of salt water from the northern side channel re-enters the estuary just downstream of the weakened salinity front from the mouth of the estuary. This holds the salt front in place for the remainder of the ebb tide, and the additional input of salt strengthens the salinity difference across the front. So, the front is able to advance far upstream during the following flood tide. Our measurements over time of the salinity and velocity of the water at each mooring showed us that fronts enable salt water to reach far upstream and most likely expand into regions that previously experienced only fresh or mostly fresh water. The fronts may even change the ecosystem, favoring those species that can thrive in a dynamic environment. On land, the introduction of fronts would be like having sudden 10° Fahrenheit cold fronts that arrive every day at noon and midnight, lasting several hours each time before the temperature gradually warms back up. It might feel like only an inconvenience to us, but plants and insects that aren’t used to such large changes in daily temperatures would likely die off or head for a warmer climate. 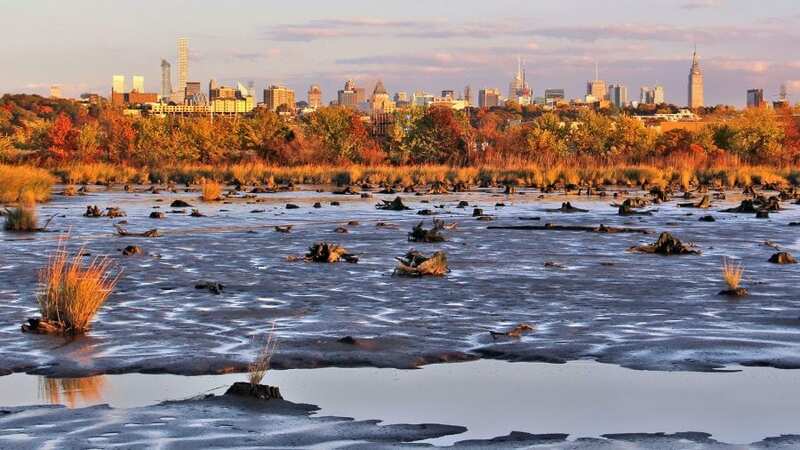 A similar shift happened in Newark Bay, as the cedar groves died under the increasingly salty conditions, and the freshwater marsh transitioned into the salt marsh we see today. There is some evidence to suggest that the fronts also divide the estuary into a series of segments, each with its own tidal conditions and average salinity. If that’s the case, the fronts may have also increased the amount of time it takes to flush pollutants and detritus out of the bay. Our research has given us insights into how the bay behaves today, and it has revealed how similar engineering projects may have changed the original conditions of other estuaries. That enables us to put together the pieces of the puzzle to create a numerical model that reproduces the fluid dynamics in the bay. That model will enable us to peer back in time to figure out how the past century and a half of dredging and port construction have changed Newark Bay. It will also provide insights into how harbor construction can modify the circulation and ecosystems in estuaries, so that we can design harbors in the future to minimize detrimental impacts. This research was funded by a National Science Foundation Coastal Science, Engineering, and Education for Sustainability grant. Bryce Corlett was also supported by a Hudson River Foundation Mark B. Bain Graduate Fellowship, The J. Seward Johnson Fund, and the Henry A. Jr. and Elisabeth W. Morss Education Fund. In 1845, Newark Bay was a pristine salt marsh (left). It has been steadily filled in and dredged and reshaped with two large side channels to create one of the biggest ports in the world today (right). Fresh Water Below the Seafloor?